Why Use LinkedIn Sponsored InMail and Account Based Marketing? Everything you need to know about LinkedIn sponsored InMail, Account-Based Marketing - and using the two together. Sponsored InMails are essentially the paid counterpart of everyday InMail. If you’ve ever used LinkedIn InMail, you’ll know that InMails are essentially personal messages that you can send to your connections - a little like an email. However unlike regular InMail, Sponsored InMail functions a little like a sponsored update campaign - and the messaging can be directly targeted and personalised to a specific audience of individuals. According to LinkedIn, Sponsored InMails are a way to “Send personalized messages to the people who matter most to your business”. With them, you can directly share and target content, send personalised messaging, rotate message variations and more. And, as InMail recipients receive a notification of new InMails, Sponsored InMail visibility also encourages further conversion. Regular InMail Vs. Sponsored InMail - What’s the Difference? There are of course key differences to note between InMail, and Sponsored InMail. User Access. For LinkedIn users wanting to use regular InMail, the process is simple - any user with a subscription to a LinkedIn premium account can use the InMail function. Depending on the level of your account, you are allowed to send a limited number of InMails per month. Bulk Messaging. With regular InMail, it is not easy to bulk message your audience as it is designed to be a personal tool. However, you can save templates and purchase InMail message credit. Typical plans only allow you to send 15-30 InMail messages from your account - meaning it is not easy to send InMail to your entire network. However, this limited, personalised access makes InMail a useful tool for sales professionals. Notification. InMails appear in the user's message notifications, and clearly appear as a personalised message. Cost. If you are connected with someone on LinkedIn (1st degree connection), you can message them free. LinkedIn users with a paid subscription will be allocated a set number of InMails that they can use to reach prospects they are not connected with. This amount varies depending on the subscription plan, but subscribed users have the option to purchase additional InMail credits. Self Served. When the Sponsored InMail feature was first released, campaigns had to be fully managed by LinkedIn. Now however they are self served, giving individual users full control of their campaigns in the same manner as sponsored updates. Bulk Messaging. Sponsored InMails can be sent to all active members who fit your targeting parameters. Notification. Sponsored InMails appear in the message center the same way as regular InMail. However receivers can easily see (before they open the message) that it has been sponsored. Cost. When Sponsored InMail was first released, campaigns requireds a set budget before commencing - and did not have the ability to run a small test campaign. Now however, campaigns run in the same vein as Sponsored Updates. Minimum cost per send is around £0.20, and the minimum budget per campaign is £8.00 per day. 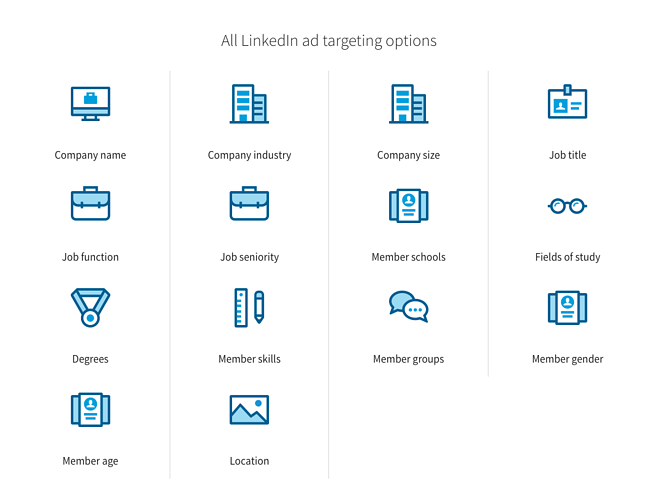 Regarding audience targeting options, when selecting targeting options for LinkedIn campaigns, LinkedIn displays an estimate of the audience size you’ll be able to reach. The minimum audience size required to run an advertising campaign is 300. For Sponsored InMail campaigns, the best practice audience size is 100,000 or fewer. In addition to very specific audience segment targeting, another factor that makes Sponsored Inmails more appealing than regular InMail or email, is that LinkedIn will only send out a sponsored InMail to a user when that user is online. LinkedIn recommends InMail mainly for lead generation, and more specifically for the promotion of webinars, ebooks and other content. A 2013 GE case study on Sponsored InMails suggests some very positive campaign outcomes, especially open rates which reached 13%. Plus, now that it’s possible for marketers to self-manage campaigns (rather than have LinkedIn manage them on your behalf), Sponsored InMail campaigns now have the same reactivity and adjustability as you would expect from a Sponsored Update campaign. Giving you the option to optimise and adjust messaging and ad variations, this means marketers can ensure their Sponsored InMails are always on track to achieve the best results possible. You can send a message to an uncluttered inbox. LinkedIn users can only receive 1 Sponsored InMail every 60 days. To reach all of your potential audience this may require a lot of time depending on how many other advertisers are sending LinkedIn InMails to the same person. Make sure promoted content remains relevant! Personalisation options are available similar to an email campaign (eg. ‘Hi First Name’). Because the InMails are clearly marked as ‘Sponsored’, users may feel that the messages are intrusive. You can add a Call-to-Action. The minimum campaign budget is £8.00 per day (£0.20 per message send). LinkedIn claims 100% deliverability, as it only sends Sponsored InMails when targeted users are active on LinkedIn. 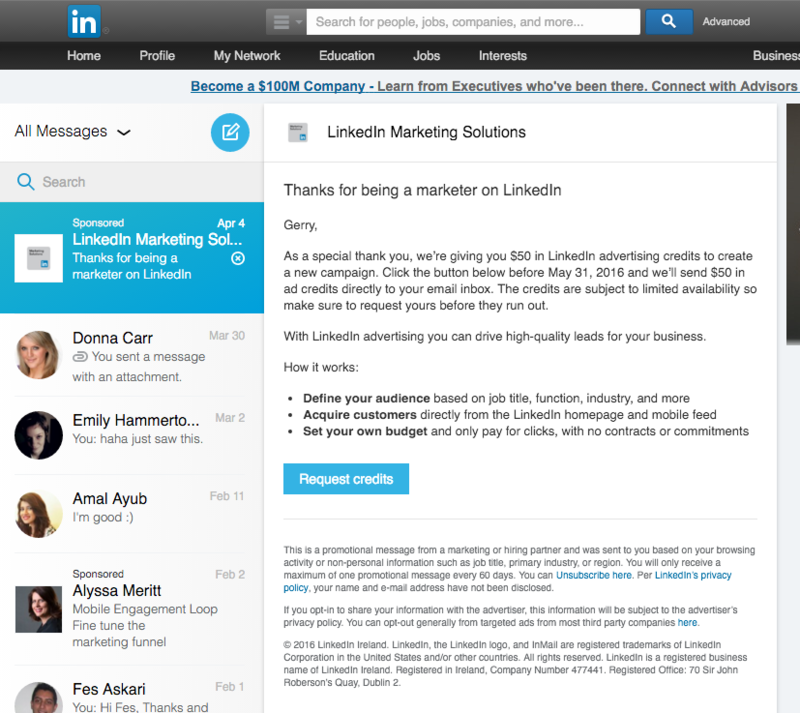 When first released, Sponsored InMail Campaigns had to be managed by LinkedIn. But now, they are self served, giving greater reactivity and ability to optimise copy, images etc. Previously there were no real-time analytics for Sponsored InMail. This has since changed; Sponsored InMail now has full real time analytics in the same style as Sponsored Updates. Highly targeted using LinkedIn’s intel. It is now possible to adjust and optimise Sponsored InMail targeting at any time, for more effective campaigns. Help from LinkedIn to optimise your campaign. Optional ABM (account targeting). LinkedIn’s account targeting feature allows you to prioritise your campaigns for a specific list of accounts. Read below. 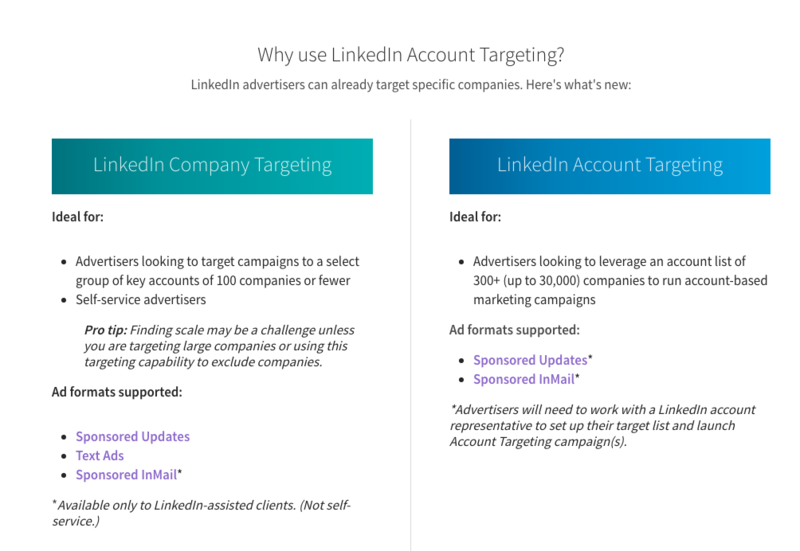 As Account-Based Marketing is increasingly considered as a B2B strategy, LinkedIn has also released features such as Account Targeting to help marketers reach and build connections with decision makers at their target accounts. Marketers can use Account Targeting to match their target account list(s) against 13 million company pages, which will then create a target segment based on matches. This allows users to really refine their audience (by job function, seniority etc), and ensure they only engage with the most relevant people, from the most relevant companies. Although in the past marketers could only target up to 100 companies, after a few recent changes, marketers can now “expand their targeting to up to 30,000 accounts”. Clearly Account Targeting offers excellent pinpoint targeting of your best-fit prospects. But what gives a real edge is the option to now enhance ABM campaigns with it - as well as with tactics such as Sponsored InMails and Sponsored Updates. With Account Targeting on LinkedIn, marketers have access to an extra tactic to enhance ABM campaigns - not only can you identify wider segments of persona-relevant prospects, but by combining Account Targeting with Sponsored InMail for example, you can then target those specific accounts relevant content, and start to build a relationship.